BLOOD IS THICKER THAN CRIME IN A.S. CROWDER’S ‘SMOKE GETS IN YOUR EYES-ONLY 99 CENTS! Crime and Family collide in SMOKE GETS IN YOUR EYES, a pulpy period short story by A. S. Crowder, now available as a Pro Se Single Shot! Helen revels in the pulsing nightlife in her home city of New Orleans. She has a fashionable look, a bootlegger boyfriend, and a city full of speakeasies to explore. She also has an older sister who staunchly opposes Helen's involvement in the city's shady underground. On one eventful night, Helen discovers that her sister is neck deep in her boyfriend's business and that her boyfriend is less than happy with her sister's work. When a threat to her sister's life is revealed, Helen takes action, planning to take down her boyfriend's organization one man at a time. SMOKE GETS IN YOUR EYES by A. S. Crowder. From Pro Se Productions. 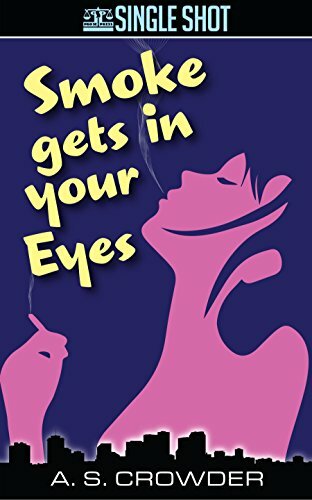 Featuring an evocative cover and logo design by David Foster and digital formatting by Antonino Lo Iacono and Marzia Marina, SMOKE GETS IN YOUR EYES is available now at Amazon for only 99 cents at https://www.amazon.com/Smoke-Gets-Your-Eyes-Crowder-ebook/dp/B01N9WBCYO/ref=sr_1_1?ie=UTF8&qid=1492023375&sr=8-1&keywords=Smoke+Gets+In+Your+Eyes+crowder. It is also available for most digital platforms via Smashwords at https://www.smashwords.com/books/view/699690. ‘THE AGELESS MAN OF SCREAMING ROCK’ DEBUTS FOR 99 CENTS! DON THOMAS’ ‘THE BROTHERS JADE’ NOW AVAILABLE ON AUDIO!